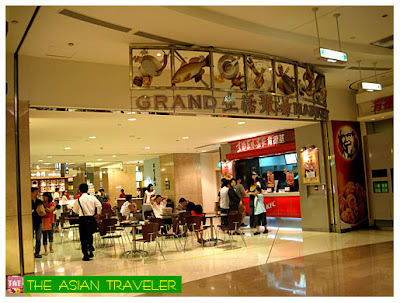 After sauntering the upmarket mall of Taipei 101, hb and I were both starving so we looked for a restaurant. We proceeded to the basement 1 of the tower which is the Grand Market. It is a 22,810 square-meter size comprises mainly of food courts, fast-food restaurants and a supermarket. The place has plenty of room to sit down and the food booths offer a pretty wide array of nouveau cuisine in a very casual atmosphere. They do have a great selection of combo meals. Ordering food here is a bit confusing and a daunting task to some beginners especially if you don't speak their language. 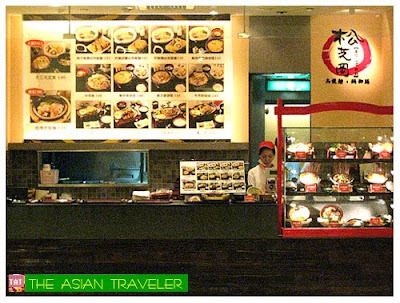 We ordered based on the picture menu on display just by pointing it out (prices range from NT 100 to 145). It came out pretty fast after we ordered it. 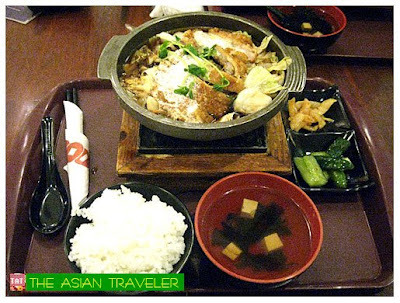 Our combo meals were served with steamed rice, soup and side dishes. Fortunately, the foods were virtually as superior as they appeared in the pictures. So, we eagerly started to devour even it was still a little hot. In summary, this was the best set meal we've found in Taipei. The food was pretty exceptional at a very reasonable price. I'm pretty sure this place attracts people even with a more discerning taste in food. Before heading out, we decided to dawdle a bit in the area. 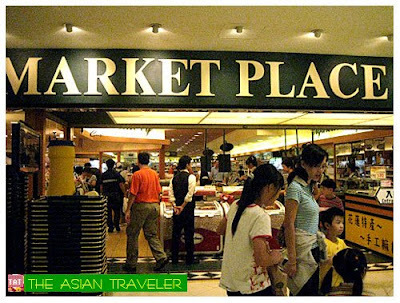 Luckily, we spotted this refined and upscale supermarket called "Jason's Market Place". As soon as we stepped inside, the bakeshop caught my attention. You'll see an excellent range from traditional "every day" loaves to more quirky bread like the one in the photo below. When I saw this, I was tempted right away to take a nice shot. But one of the workers, a middle-aged woman spoke to me in Chinese; I presumed she was telling me not to take photos. So, I stopped and responded apologetically. I felt a bit embarrassed at that time since it was my first time to be admonished but I got over it quickly (this is the risk when you're taking photographs). The market is divided into eight major sections. A number of goods offered here are fresh produce, meat delicatessen, and unconventional salad bar, large collection of wines, health foods, spices / condiments and grocery items. The market concentrates mostly on Western food products but there are also goods from Japan and China. Jason's Market Place is located in Taipei 101's first basement level. 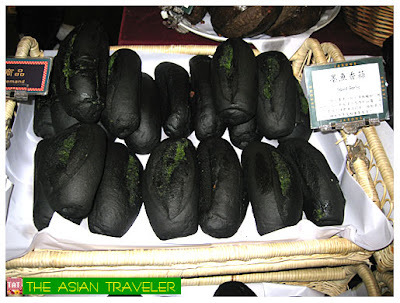 The black bread doesn't look very tasty to me. I find that squid quirky bread a little bit "burnt" haha. I doubt if I'll have a taste of it, it sure doesn't look so good! 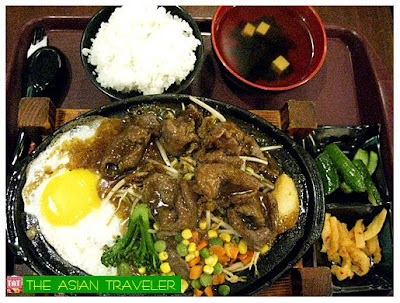 sarap sigurong mag-food trip sa taipei....mahal ba pumunta dyan? i'd definitely love to try the squid garlic bread! and it's very inventive that they colored it black (from the squid ink, perhaps?)! Thanks for the food trip tips! They serve in huge portion. i would have definitely done the same thing. just by the looks of that bread, it's unique. i wonder what it tasted like. Oh, gawd! Your delicious food pictures nearly killed me. hi..one of the nice travel blog..
did you try the squid garlic bread? Just from the appearance i won't dare to try... just curious about the taste. wow....parang gusto ko na rin pumunta ng taipei...maganda rin ba mag-shopping sa pinuntahan mo? Hi Asian Traveller! Sorry for the long delay in coming here, but the last two weeks were too hectic! Loved the 101 Tower!! Great pictures! Meanwhile Blogtrotter is still in Greece! Hope you enjoy and have a great week! That black charcoals are actually squid garlic bread??? Aw aw aw..the foods look good! Make me hunggry! Not really expensive. 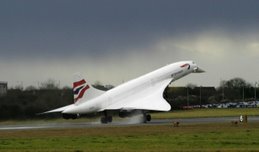 You just have to wait for airline promos. Sadly, I never tried it. We never really shop there. We spent most of our time just touring around the city. I really don't have an idea if they use squid ink for that bread. Looked like a fun place.